IL-10 is an anti-inflammatory cytokine produced in the joint in rheumatoid arthritis by macrophages and infiltrating blood lymphocytes. Regulation of its expression is poorly understood, but previous findings have suggested that physical interactions with T cells may play a role. This report investigates signalling mechanisms involved in the production of macrophage IL-10 upon interaction with fixed, cytokine-stimulated T cells (Tck). Elutriated monocytes were differentiated to macrophages by macrophage-colony-stimulating factor (M-CSF) and co-cultured with fixed T cells chronically stimulated in a cytokine cocktail of IL-2/IL-6/tumour necrosis factor (TNF)-α in the presence or absence of wortmannin and LY294002, inhibitors of phosphatidylinositol 3-kinase (PI3K), or of rapamycin, an inhibitor of p70 S6-kinase (p70S6K). Spontaneous IL-10 production by rheumatoid arthritis synovial-membrane mononuclear cells (RA-SMCs) and co-cultures of rheumatoid arthritis T cells (RA-Ts) and macrophages was also assessed. RA-T and Tck induction of macrophage IL-10 production was suppressed by cell separation and inhibition of PI3K and p70S6K. PI3K involvement was also shown by phosphorylation of the downstream effector protein kinase B. Spontaneous IL-10 production by RA-SMCs was also inhibited by LY294002 and depletion of the nonadherent (T-cell-enriched) fraction of the cell population. IL-10 production in RA-SMCs and M-CSF-primed macrophages, activated by interaction with Tck, is PI3K- and p70S6K-dependent. IL-10 is an anti-inflammatory cytokine spontaneously produced by monocytes/tissue macrophages in the rheumatoid joint , regulating IL-1 receptor antagonist (IL-1Ra)/IL-1β and tumour necrosis factor (TNF)-α in rheumatoid synovium [1,2]. Histological studies of synovium in rheumatoid arthritis (RA) have established that macrophages are in close contact with T cells in the inflamed interstitium , suggesting that contact signals between macrophages and T cells may be of importance in vivo in modulating cytokine production. Direct, contact-mediated interaction between monocytes and activated lymphocytes in vitro induced synthesis of IL-1β, TNF-α, IL-10 and metalloproteinases [4,5,6,7,8]. The mechanisms of T-cell activation determine the monocyte cytokine profile. T cells can be activated antigen-independently using a combination of inflammatory cytokines (IL-2, IL-6 and TNF-α) or IL-15 alone , suggesting a role for bystander activation of T cells in RA. These cytokine-stimulated cells (Tck) did not induce monocyte production of IL-10 , whereas T cells activated through the T cell receptor (TCR)/CD3 system did. Macrophages differentiated in vitro from monocytes mimic tissue macrophages present in the synovial joint. Thus, differentiation might influence the profile and amount of cytokines. Macrophages primed with macrophage-colony-stimulating factor (M-CSF) produce IL-10 in response to CD40 ligation . We therefore investigated whether differentiation of monocytes to macrophages, cells more representative of the rheumatoid synovium, would alter the ability of T cells stimulated antigen-independently to induce IL-10. The signalling mechanisms by which T-cell interactions induce macrophage IL-10 are unclear. We have shown that the lipid kinase phosphatidylinositol 3-kinase (PI3K) and its downstream substrate p70 S6-kinase (p70S6K) mediate IL-10-induced responses . However, little is known about IL-10 production, although PI3K mediates CD45-ligation-induced monocyte TNF-α production . The aim of this study was to investigate signalling pathways downstream of cell-to-cell contact between T cells and macrophages involved in IL-10 production in the context of PI3K and p70S6K. Mononuclear cells from synovial membranes in rheumatoid arthritis (RA-SMCs) were prepared by collagenase and DNase digestion of membranes as described elsewhere . T cells were enriched using Dynabeads coated with anti-CD3 antibodies in accordance with the manufacturer's specifications (Dynal, Bromborough, Wirral, UK). The resulting RA synovial-membrane T cells (RA-Ts) were fixed in glutaraldehyde before co-culture (see below). Nonadherent cells were depleted from RA-SMCs by adherence (see Supplementary materials and methods). Human peripheral blood mononuclear cells (PBMCs) were obtained from density centrifugation of buffy coats from human venous blood through Ficoll/Hypaque density centrifugation medium (Nycomed Pharma AS, Oslo, Norway). PBMCs were centrifugally elutriated in a Beckman JE6 elutriator (Beckman RIIC Ltd, High Wycombe, Bucking-hamshire, UK). Lymphocyte and monocyte purity was assessed by flow cytometry: T cells were routinely >90% pure and monocytes >85% pure. T cells were stimulated for 8 days in 25 ng/ml TNF-α, 25 ng/ml IL-2 and 100 ng/ml IL-6, using an established technique . Lymphocytes were fixed in glutaraldehyde in accordance with the method previously described . Monocytes were differentiated with M-CSF for 7 days in accordance with the protocol used previously . Adherent cells were washed and removed from the plastic with cell-dissociation medium (Sigma, Poole, UK). The resulting adherent cells were washed and resuspended in RPMI-1640/10% FCS medium (BioWhittaker Europe Ltd, Verviers, Belgium) ready for use. M-CSF-primed macrophages were plated at 1 × 105 cells/well and allowed to settle in 96-well flat-bottomed plates for 1 hour before addition of autologous T cells. Macrophages were pretreated for 1 hour with the PI3K inhibitors wortmannin and LY294002 or the p70S6K inhibitor rapamycin. Fixed Tck or RA-Ts were added to achieve a predetermined T:macrophage ratio of 5:1 for maximal cytokine production and incubated for 24 hours, after which supernatants were harvested and stored at -20°C until ELISA. Alternatively, co-cultures were set up in 12-well plastic tissue-culture plates at a T:macrophage ratio of 5:1 with the macrophage density set at 5 × 106 per well, for western blot analysis of phosphorylated protein kinase B (phospho-PKB) and phosphorylated p70S6K (phospho-p70S6K). The culture was stimulated for 30 min, after which cells were lysed (see Supplementary materials and methods). IL-10 sandwich ELISAs were carried out in accordance with the manufacturer's specifications (PharMingen International, Oxford, UK). Assay was performed with a standard curve of recombinant human (rhu)IL-10 from 13–10,000 pg/ml  and showed no cross-reactivity with any cytokine tested. After co-culture, cells were lysed on ice for 15 min in lysis buffer (see Supplementary materials and methods) and separated by SDS-PAGE and were western blotted in accordance with the method described elsewhere . Phosphorylated proteins were detected using antibodies raised against phospho-PKB (ser473) and phospho-p70S6K (thr389) and were compared with total protein kinase B (PKB) and p70S6K. Tck did not induce monocyte IL-10 production. We wished to find out whether macrophages primed with M-CSF would produce IL-10 in response to Tck, and they did (192 ± 13 pg/ml) (Fig. 1). Fixed Tck did not secrete cytokines but induced cytokine production by physical contact with the macrophages: separation of the cell types by a semipermeable membrane insert abrogated cytokine production. Cytokine-stimulated T cells induce IL-10 production by M-CSF- primed macrophages in a contact-dependent manner. Cytokine-stimulated T cells were co-cultured with macrophages and monocytes that had been primed with M-CSF. In some co-cultures, semipermeable membranes were inserted to separate the two types of cell being incubated (indicated on the chart by 'insert'). Bars show mean concentrations of IL-10 in triplicate culture supernatants ± SD, for a representative of N = 5 replicate experiments. Macro = M-CSF-primed macrophages; M-CSF = macrophage-colony-stimulating factor; Mono = monocytes. The role of PI3K in induction of macrophage IL-10 by Tck was addressed using the PI3K inhibitors LY294002 and wortmannin. 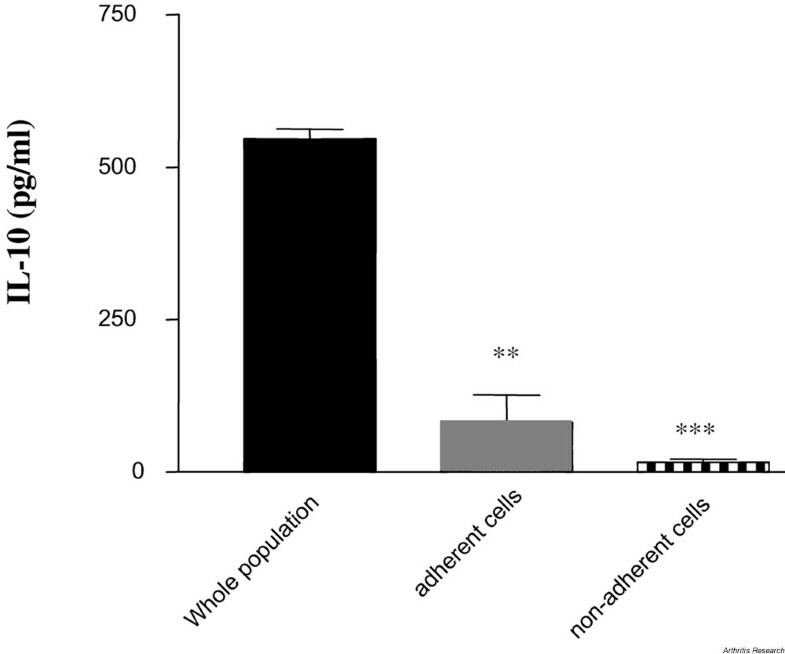 LY294002 dose-dependently inhibited macrophage IL-10 production (control cells produced 176 ± 7 pg/ml versus 39 ± 34 pg/ml for cells in 25 μM LY294002) (Fig. 2a). These data were considered PI3K-specific, as these results were reproduced by wortmannin, which (at 500 nM) suppressed IL-10 from 555 ± 125 pg/ml to 140 ± 22 pg/ml (Fig. 2b). PI3K activation was further shown by phosphorylation of a downstream effector, PKB, which is phosphorylated at ser473 upon interaction of macrophage with Tck (Fig. 2c, lane 3). This PKB activation was abrogated by wortmannin (lane 4) and LY294002 (lane 5). Induction of macrophage IL-10 by cytokine-stimulated T cells (Tck) is PI3K- and p70S6K-dependent. Tck were co-cultured with M-CSF-primed macrophages at a T:macrophage ratio of 5:1. Before co-culture, macrophages were treated for 1 hour with PI3K inhibitor LY294002 (a) or wortmannin (b) or with the p70S6K inhibitor rapamycin (d). Bars show mean IL-10 concentrations in triplicate culture supernatants ± SD, for a representative of N = 5 replicate experiments. Western blot analysis of activated phospho-PKB (c) shows that the downstream effector PKB was activated by Tck and that the effect was abrogated by wortmannin (500 nM) and LY294002 (5 μM). Lane 1, macrophage control; 2, Tck control; 3, macrophage+Tck; 4, macrophage+Tck+wortmannin (500 nM); 5, macrophage+Tck+LY294002 (5 μM). In addition, Tck activate macrophage p70S6K, which is PI3K-independent (e). Lane 1, macrophage control; 2, macrophage+Tck; 3, macrophage+Tck+wortmannin (500 nM); 4, macrophage+Tck+LY294002 (5 μM). Data are representative of N = 3 replicate experiments. M-CSF = macrophage-colony-stimulating factor; p70S6K = p70 S6-kinase; p85S6K = p85 S6-kinase (nuclear isoform of p70 S6-kinase); phospho-p70S6K = phosphorylated p70 S6-kinase; (phospho-)PKB = (phosphorylated) protein kinase B; PI3K = phosphatidylinositol 3-kinase. *P < 0.05, **P < 0.01, ***P < 0.001. Because activation of p70S6K is both PI3K-dependent [14,15] and PI3K-independent [16,17], we investigated whether p70S6K is involved in Tck induction of IL-10, using rapamycin, the inhibitor of mammalian target of rapamycin (mTOR), an upstream activator of p70S6K. Rapamycin dose-dependently suppressed macrophage IL-10 (control cells produced 192 ± 13 pg/ml, versus 38 ± 7 pg/ml for cells in 1 nM rapamycin) (Fig. 2d). Western blot analysis showed that p70S6K and its nuclear isoform p85S6K are activated upon macrophage interaction with Tck: p70S6K was phosphorylated at Thr389 (Fig. 2e, lane 2). Activation of p70S6K was PI3K-independent, however, as it was not suppressed by wort-mannin (lane 3) or LY294002 (lane 4). We investigated whether RA-Ts were capable of inducing IL-10. Neither fixed RA-Ts nor elutriated monocytes spontaneously produce IL-10. When the two cell types were co-cultured, however, monocytes produced IL-10 (146 ± 26 pg/ml at a ratio of 7:1 T cells:macrophages [T:M]; Fig. 3a). This IL-10 production was a consequence of physical interaction between the cells, as it was abrogated by separating them with a semipermeable membrane. 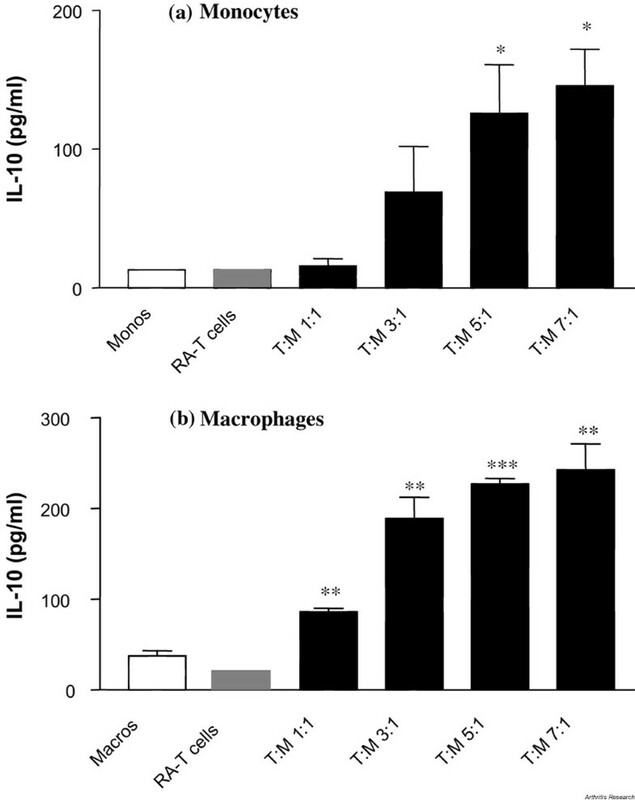 In addition, RA-Ts induced IL-10 upon interaction with M-CSF-primed macrophages, while these macrophages produced similar or higher levels of IL-10 in co-culture (243 ± 28 pg/ml at a T:M ratio of 7:1; Fig. 3b). T cells from synovial membranes in rheumatoid arthritis (RA-Ts) induce production of IL-10 by monocytes and macrophages. RA-Ts were co-cultured with resting monocytes (a) or M-CSF-primed macrophages (b). Bars show mean IL-10 in triplicate culture supernatants ± SD, for a representative of N = 3 replicate experiments. Macros = M-CSF-primed macrophages; M-CSF = macrophage-colony-stimulating factor; Monos = monocytes; T:M = ratio of RA-Ts to (panel a) monocytes or to (panel b) M-CSF-primed macrophages. *P < 0.05, **P < 0.01, ***P < 0.001. This report establishes that RA-Ts induce IL-10 production by monocytes and M-CSF-primed macrophages. To compare signalling events between Tck and RA-Ts leading to macrophage IL-10 production, we investigated PI3K and p70S6K involvement. In co-cultures of RA-Ts with M-CSF-primed macrophages at a T: macrophage ratio of 5:1, IL-10 production was 178 ± 19 pg/ml; production was suppressed to 68 ± 4 pg/ml and 39 ± 9 pg/ml by rapamycin and wortmannin, respectively (Fig. 4). Induction of macrophage IL-10 production by T cells from synovial membranes in rheumatoid arthritis (RA-Ts) is PI3K- and p70S6K-dependent. RA-Ts were co-cultured with M-CSF-primed macrophages in the presence or absence of the PI3K inhibitor wortmannin (50 nM) or the p70S6K inhibitor rapamycin (1 nM). Bars show mean IL-10 in triplicate culture supernatants ± SD, for a representative of N = 3 replicate experiments. p70S6K = p70 S6-kinase; PI3K = phosphatidylinositol 3-kinase; Rapa = rapamycin; T:M = ratio of RA-Ts:macrophages; Wort = wortmannin. *P < 0.05, **P < 0.01. Macrophages and T cells from synovial tissue in RA produce IL-10 . To investigate cognate cell interactions in regulating IL-10 production in this tissue, we cultured RA-SMCs as a whole population or after depletion of the nonadherent, T-cell-rich fraction. Depletion of nonadherent cells suppressed spontaneous IL-10 production: upon in vitro culture (Fig. 5), the whole population of RA-SMCs produced 547 ± 16 pg/ml IL-10, adherent cells produced 82 ± 45 pg/ml and nonadherent cells produced 16 ± 5 pg/ml. Spontaneous production of IL-10 by mononuclear cells from synovial membrane in rheumatoid arthritis (RA-SMCs) is dependent on interactions between adherent and nonadherent cells. RA-SMCs ('whole population'), SMC adherent cells (depleted of nonadherent cells) and nonadherent cells (T-cell enriched) were cultured in 24-well plastic tissue-culture plates (1 × 106 cells/ml per well) for 24 hours. Bars show mean IL-10 in triplicate culture supernatants ± SD, for a representative of N = 3 replicate experiments. **P < 0.01, ***P < 0.001. We have established that PI3K regulates Tck induction of macrophage IL-10 and wished to investigate PI3K-dependence of IL-10 production in the rheumatoid synovium. Therefore, LY294002 and wortmannin were used on RA-SMCs. 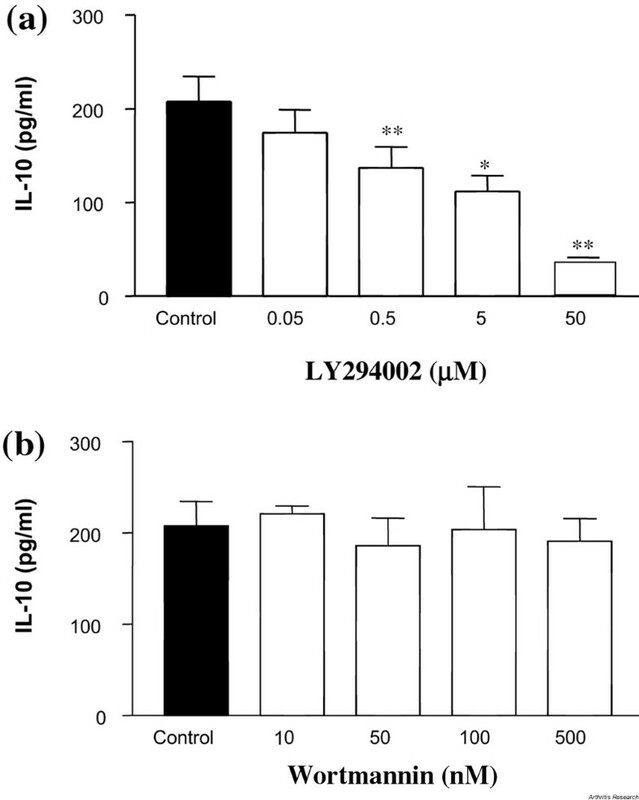 LY294002 dose-dependently inhibited spontaneous IL-10 production (control cells produced 208 ± 27 pg/ml versus 112 ± 17 pg/ml for cells in 5 μM LY294002), whereas wortmannin did not (control 208 ± 27 pg/ml compared with 191 ± 25 pg/ml at 500 nM) (Fig. 6). Spontaneous production of IL-10 by mononuclear cells from synovial membrane in rheumatoid arthritis (RA-SMCs) is inhibited by LY294002 but not by wortmannin. RA-SMCs were incubated with the PI3K inhibitors LY294002 and wortmannin for 24 hours. Bars show mean IL-10 in triplicate culture supernatants ± SD, for a representative of N = 4 replicate experiments. *P < 0.05, **P < 0.01. M-CSF-primed macrophages, unlike monocytes, produce IL-10 when stimulated by Tck. The ability of M-CSF-primed macrophages to produce IL-10 in response to Tck as well as other stimuli such as CD40 ligation  indicates that M-CSF priming per se is essential for IL-10 production, biasing membrane-receptor expression or signalling networks. M-CSF is required to preprogramme monocyte differentiation, as addition to monocyte co-culture failed to induce IL-10. M-CSF is readily detected in the RA joint (reviewed ), and this may explain why IL-10 is found in RA-SMC cultures . Tck may represent the T-cell phenotype in the rheumatoid synovium [6,9], and interaction with M-CSF-primed macrophages may mimic the mechanism of IL-10 production in the rheumatoid joint. In support of this hypothesis, spontaneous IL-10 production by RA-SMCs was reduced upon depletion of the nonadherent (T-cell enriched) fraction of the cell population. 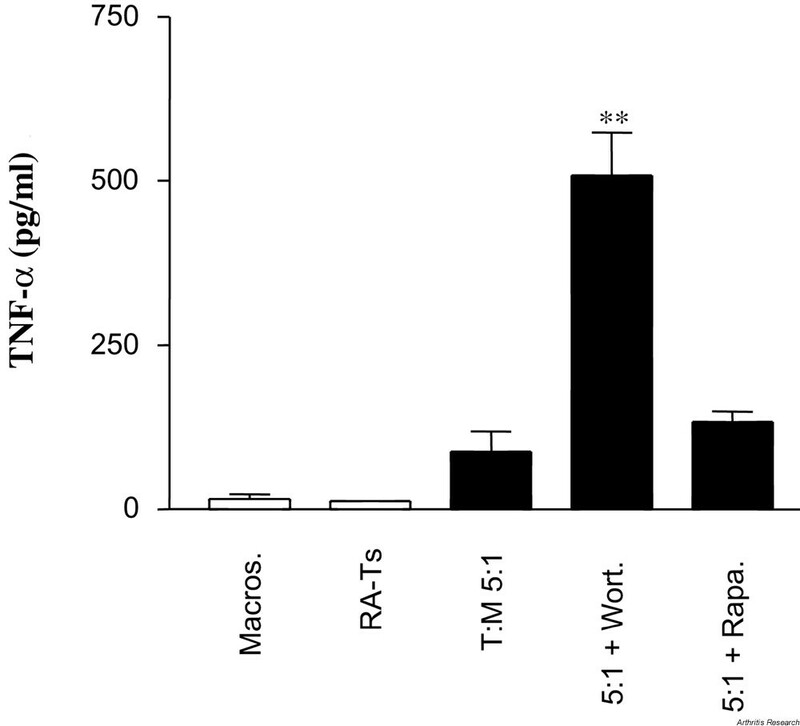 In addition, RA-Ts and Tck both induced macrophage IL-10. However, RA-Ts also induced monocyte IL-10 whereas Tck did not, suggesting that although these two types of T cell express similar phenotypes, there maybe undefined membrane proteins present on RA-Ts or that there may be higher expression of such proteins in RA-Ts than in Tck. PI3K positively regulates Tck-induced macrophage IL-10 production. Spontaneous IL-10 production by RA-SMCs was also PI3K-dependent, as LY294002 inhibited cytokine production. Wortmannin, however, did not affect IL-10 production, in contrast with Tck, which induced IL-10 in macrophages. This difference in sensitivity to wortmannin between macrophages and RA-SMCs may represent a potency effect or differential utilisation of PI3K isoforms. The distal PI3K signalling molecules, PKB and p70S6K [19,20,21,22] were also activated. The suppression of macrophage IL-10 by rapamycin suggests that PI3K-dependent IL-10 production is p70S6K-dependent. Upstream regulators of p70S6K include mTOR , PI3K , MAPK (mitogen-activated protein kinase)  and PKB . It is unclear whether p70S6K is downstream of PI3K or represents an alternative, independent pathway. Several studies have found p70S6K to be PI3K-dependent [14,15] as well as PI3K-independent, downstream of PKC and p42/44 MAPK [16,17]. We have found that macrophage IL-10 requires PI3K and p70S6K activation; however, p70S6K activation appears to be PI3K-independent, as neither of the PI3K inhibitors suppressed p70S6K phosphorylation. These data show that the interaction between Tck and macrophages induces the anti-inflammatory cytokine IL-10. The production of this cytokine resulting from such interactions is regulated by PI3K and p70S6K. Studies of the signalling pathways involved in the regulation of proinflammatory and anti-inflammatory mediators may define therapeutic targets for chronic inflammatory diseases such as RA. M-CSF-primed monocytes produce IL-10 upon interaction with Tck. We observed that the signalling pathway involved in macrophage IL-10 production and in RA synovial tissue cells is PI3K- and p70S6K-dependent. IL-2, IL-6 and TNF-α were kind gifts from Dr U Gubler (Hoffmann-La Roche, Nutley, NJ), Dr P Ramage (Sandoz, Pharma Ltd, Basel, Switzerland) and Dr W Stec (Centre of Macromolecular Studies, Lodz, Poland), respectively. IL-10 and TNF-α ELISA reagents were purchased from PharMingen International (Oxford, UK). The inhibitors LY294002, wortmannin and rapamycin were purchased from Sigma (Poole, Dorset, UK) and antibodies against PKB, and p70S6K from New England BioLabs (UK) Ltd (Hitchin, Hertforshire, UK). All reagents were tested for the presence of lipopolysaccharide/endotoxin contamination and were found to be below the lower level of detection of the limulus amaebocyte assay (BioWhittaker, Berkshire, UK). RA synovial-membrane mononuclear cells (RA-SMCs) were obtained from samples of synovial-membrane tissue provided by the Rheumatology Clinic, Charing Cross Hospital, London, UK. All patients gave their signed consent, and ethical approval was obtained from the Riverside Research Ethics Committee (London). Patients met the American College of Rheumatology (ACR) 1987 revised criteria for RA. In brief, tissue was cut into small pieces and digested in medium containing 0.15 mg/ml DNAse type I (Sigma, UK) and 5 mg/ml collagenase (Roche, UK) for 2 hours at 37°C. Cell debris was excluded by passing cells through a nylon mesh. Cells were then washed and collected in RPMI/10% FCS at a density of 1 × 106 cells/ml and used immediately for spontaneous cytokine production by RA-SMCs, or CD3+ T cells/nonadherent cells were depleted from adherent cells. T cells were enriched using direct, positive selection using Dynabeads (Dynal) coated with anti-CD3 antibodies. Mononuclear cells (1 × 107) were treated with 100 μl anti-CD3-coated Dynabeads for 20 min at 4°C under conditions of constant rotation. Cells attached to beads were separated from unbound cells by using a magnetic particle concentrator (Dynal) and cultured for 6 hours at 37°C. Detached cells were removed from the beads by washing them twice in medium, in the presence of the magnet. CD3+ T cells obtained were of high purity (>95%) and viability (>90%). RA CD3+ T cells were predominantly CD4+ CD45RO+. In addition, the T-cell activation markers human leukocyte antigen (HLA)-DR and CD69 were also present, suggesting that RA CD3+ T cells were of an activated, memory phenotype closely resembling that of Tck . The resulting RA-Ts were suspended in RPMI 1640 medium ready for fixation before co-culture assays (see below). Nonadherent cells were depleted from RA-SMCs: briefly, RA-SMCs were adjusted to a density of 2 × 106 cells/ml in RPMI 1640/5% FCS and left to adhere to plastic 6-well plates for 2 hours at 37°C, after which nonadherent cells were removed and adherent cells washed twice in RPMI 1640 medium. Adherent cells were removed and cultured overnight, and again nonadherent cells were washed off with RPMI 1640 medium. The resulting adherent RA-SMCs were harvested and resuspended to a density of 2 × 106cells/ml ready for comparison of their IL-10 production with spontaneous production by whole-population RA-SMCs. RA-Ts isolated from synovial tissue by positive selection using magnetic beads coated with anti-CD3 antibodies may become activated by the beads. Therefore, we investigated the ability of such beads to further stimulate these cells. We found that CD3+ separated RA-Ts behaved like nonadherent (T-cell enriched, >70% CD3+) RA-SMCs with respect to the ability to induce monocyte or macrophage production of IL-10 and TNF-α. Also, stimulation of RA-Ts for 48 hours in culture by immobilised anti-CD3 did not significantly alter upregulation of the activation markers CD69 and HLA-DR or proliferation when compared with RA-Ts alone. In addition, our group has noted that with respect to macrophage cytokine production and activation marker analysis, RA-T cells positively selected using beads coated with anti-CD2 antibodies behaved like nonadherent (T-cell-enriched) RA-SMCs and RA-Ts separated using anti-CD3 antibodies. RA-T cells are generally of an activated phenotype (predominantly CD45RO+ HLA-DR+CD69+), and, unlike their unstimulated peripheral blood counterparts, are not significantly stimulated upon separation by anti-CD3 coated magnetic beads. Human PBMCs were obtained from density centrifugation of human venous blood buffy coats, purchased from the North London Blood Transfusion Service (Colindale, UK) through Ficoll/Hypaque (specific density 1.077 g/ml; Nycomed Pharma). PBMCs were centrifugally elutriated in a Beckman JE6 elutriator. Lymphocyte and monocyte purity were assessed by flow cytometry of fluorochrome-conjugated anti-CD3, anti-CD19, anti-CD14 and anti-CD45 antibodies (Becton Dickinson, Oxford, UK). Both types of cell were routinely >90% pure (T cells, >90% CD3+, <4% CD19+, <3% CD14+; and monocytes, >90% CD14+, <0.5% CD19+, <8% CD3+). Purified T cells were routinely resuspended in RPMI 1640/10% human AB+ serum at a density of 1 × 106/ml and stimulated for 8 days at 37°C/5%CO2, in a modified version of the technique developed by Unutmaz and colleagues . To generate Tck, we cultured the lymphocytes for 8 days in the presence of saturating levels of the cytokines TNF-α (25 ng/ml), IL-2 (25 ng/ml) and IL-6 (100 ng/ml). Lymphocytes were then harvested and washed twice in PBS before fixation for 1 min on ice in PBS/0.05% glutaraldehyde. This fixation solution was neutralised to pH7.0 by addition of an equal volume of 0.2 M glycine/RPMI. Fixed cells were washed twice in RPMI medium and finally resuspended in RPMI/5% FCS and stored at 4°C until the experiment. Cells were routinely used up to 3 days after fixation without any reduction in magnitude of the cytokine response induced in the cognate assay. M-CSF-primed macrophages were washed in serum-free RPMI 1640 medium and plated at a density of 1 × 105 cells/well in RPMI 1640/10% FCS and were allowed to settle in 96-well flat-bottomed plate wells for at least 1 hour before addition of autologous T cells (cytokine profiles/amplitudes were irrespective of whether T cells were autologous or allogeneic MHC-mismatched, data not shown). When necessary, macrophages were pretreated for 1 hour with the PI3K inhibitors wortmannin or LY294002, or with the p70S6K inhibitor rapamycin. For maximal cytokine production, fixed allogeneic T cells or CD3+ RA-T cells were added to achieve a predetermined T-cell:macrophage ratio of 5:1. Each well was topped up to 200 μl with RPMI 1640/10% FCS. Each test condition was carried out in triplicate in each assay. The resulting co-culture assay was incubated at for 37°C/5%CO2 24 hours. All inhibitor concentrations used in this study were noncytotoxic to macrophages or RA-SMCs as determined by trypan blue exclusion and MTT assays. Supernatants were harvested and stored at -20°C until ELISA. In the case of phospho-PKB and phospho-p70S6K, the cognate co-culture was set up in 12-well plastic tissue-culture plates at a T-cell:macrophage ratio of 5:1, with the macrophage density set at 5 × 106per well. Culture was stimulated for 30 min at 37°C, and the cells were then lysed (see western blot analysis). T cells and macrophages were co-cultured at a ratio of 5:1, where macrophages were seeded at a density of 5 × 106 cells/ml in 24-well plates in RPMI 1640/10% FCS. When inhibitors were used, the macrophages were pretreated for 1 hour before stimulation by the addition of fixed T cells and stimulated for 30 min before harvesting of cell lysates. The stimulation time was previously defined as optimal for activation of both PKB and p70S6K. After stimulation, cells were lysed on ice for 15 min in lysis buffer (1% NP-40, 200 mM NaCl, 0.1 mM EDTA, 1 mM dithiothreitol, 1 mM Na3VO4, 1 mM NaF, 1 mM phenylmethylsulfonyl fluoride, 10 μg/ml leupeptin, 10 μg/ml pepstatin and 10 μg/ml aprotinin). Lysed samples were separated on 10% SDS-polyacrylamide gel and western blotted onto a nitrocellulose membrane. Phosphorylated proteins were detected using antibodies raised against phospho-PKB and phospho-p70S6K, followed by anti-rabbit horseradish peroxidase conjugate and detection by enhanced chemiluminescence (ECL; Amersham Pharmacia Biotech UK Ltd, Little Chalfont, Buckinghamshire, UK). Protein bands were visualised by autoradiography using Hyperfilm (Amersham Pharmacia Biotech UK Ltd). Data were compared using GraphPad Prism version 3.0 (GraphPad Software, Inc, San Diego, CA, USA). Statistical significances were determined by Student's t-test. Previously, we found that Tck induced the production of TNF-α but not IL-10 in monocytes from peripheral blood, and we wished to find out whether M-CSF-differentiated macrophages would produce IL-10 and the proinflammatory cytokine TNF-α in response to the same stimulus. M-CSF-primed macrophages produced 192 ± 13 pg/ml IL-10 (see Fig. 1) upon interaction with Tck. In addition, M-CSF-primed macrophages produced 158 ± 23 pg/ml TNF-α. In this procedure, fixed Tck did not secrete any cytokines but induced cytokine production by physical contact with the macrophages, as separation of the two cell types by a semipermeable membrane abrogated the production both of IL-10 and of TNF-α. Figure 1 shows a representative experiment of IL-10 production; other experiments varied in the amount of cytokine produced (176 ± 7 to 1567 ± 134) but resulted in similar cytokine profiles. Differences in the amount of cytokine produced are thought to be a consequence of donor variation between blood packs. The effects of Tck on cytokine production were specific to interaction of Tck or RA-Ts with monocytes/macrophages, as the addition of an exogenous cytokine cocktail (IL-2/ IL-6/TNF-α) did not induce macrophage IL-10 production as did fixed, unstimulated T cells in the presence of these cytokines (data not shown). In addition, membrane turnover would make it unlikely that surface binding of IL-2/ IL-6/TNF-α would regulate IL-10 production; if it did, monocytes would be likely to produce IL-10 in this co-culture. The role of PI3K activity in Tck induction of macrophage IL-10 production was addressed using the specific PI3K inhibitors LY294002 and wortmannin. LY294002 inhibited IL-10 production by M-CSF-primed macrophages in a dose-dependent manner, whereas in controls, IL-10 production (176 ± 7 pg/ml) was suppressed to 39 ± 34 pg/ml in 25 μM inhibitor (P = 0.0288), with a 50% inhibitory concentration (IC50) value of 3.4 μM (see Fig. 2a). These data were considered a PI3K-mediated event, as these results were reproduced by wortmannin, a commonly used PI3K inhibitor. Wortmannin (500 nM) suppressed IL-10 to 140 ± 22 pg/ml (IC50 = 4 nM), versus 555 ± 125 pg/ml in controls (P = 0.032) (see Fig. 2b). Regulation of TNF-α, on the other hand, was potentiated when PI3K was inhibited by LY294002 or wortmannin. LY294002 (25 μM) augmented TNF-α production from control levels of 158 ± 23 pg/ml to 802 ± 107 pg/ml (P = 0.0133) (50% effective dose [ED50]= 6 μM) (Supplementary Fig. 1a). Wortmannin (500 nM) augmented Tck-induced macrophage TNF-α from a control concentration of 76 ± 5 pg/ml to 321 ± 7 pg/ml (P = 0.0001) (ED50 = 35 nM) (Supplementary Fig. 1b). These data suggest that PI3K differentially regulates proinflammatory TNF-α and anti-inflammatory IL-10 – IL-10 positively and TNF-α negatively. In addition, PI3K activation was further shown by the phosphorylation of a downstream effector molecule, PKB/Akt. PKB is phosphorylated at ser473 upon interaction of macrophages with Tck (see Fig. 2c, lane 3). The control lanes containing the macrophage control (lane 1) and the T-cell control (lane 2) did not exhibit PKB phosphorylation. The T-cell control, however, did not blot for total PKB either, probably as a consequence of the fixation protocol, which is likely to have encouraged release of intracellular cytoplasmic contents. However, the T-cell control did positively stain for CD3 or LAT, molecules that are associated with the T-cell membrane. This activation of PKB by Tck was abrogated by the PI3K inhibitors wortmannin (lane 4) and LY294002 (lane 5). Induction of macrophage TNF-α by cytokine-stimulated T cells (Tck) is differentially regulated by PI3K and p70S6K. 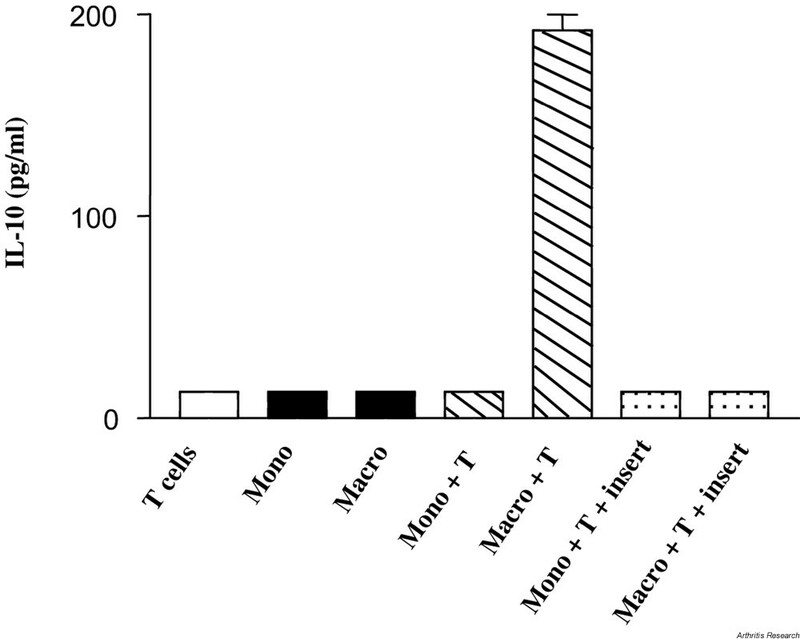 Tck were added in co-culture with M-CSF-primed macrophages at a T : macrophage ratio of 5:1. Macrophages were pretreated for 1 hour with indicated concentration of PI3K inhibitors LY294002 (a) or wortmannin (b) or with the p70S6K inhibitor rapamycin (c) before co-culture for 24 hours at 37°C/5% CO2, after which supernatants were harvested and stored at -20°C until ELISA. Bars show mean TNF-α in triplicate culture supernatants ± SD, for a representative of N = 3 replicate experiments. M-CSF = macrophage-colony-stimulating factor; p70S6K = p70 S6-kinase; PI3K = phosphatidylinositol 3-kinase; T:M = ratio of Tck to M-CSF-primed macrophages; TNF = tumour necrosis factor. *P < 0.05, **P < 0.01, ***P < 0.001. Tck induction of macrophage IL-10 and TNF-α is p70S6K-dependent. Previously, it had been reported that the activation of p70S6K is both PI3K-dependent [14,15] and PI3K-independent [16,17]. It was therefore of interest to find out whether p70S6K activation was involved in Tck induction of IL-10, using rapamycin, the inhibitor of mTOR, an upstream activator of p70S6K. Rapamycin suppressed IL-10 by M-CSF-primed macrophages in a dose-dependent manner. In Fig. 2d, IL-10 production was inhibited from control levels of 192 ± 13 pg/ml to 38 ± 7 pg/ml by 1 nM rapamycin with an IC50 value of 6 pM (P = 0.006). In addition, TNF-α was also inhibited by rapamycin, from control (510 ± 33 pg/ml) to 56 ± 6 pg/ml at 1 nM (P = 0.0013) (IC50 = 16 pM) (Supplementary Fig. 1c). Western blot analysis showed that p70S6K and its nuclear isoform, p85S6K, are activated upon macrophage interaction with fixed Tck. p70S6K was phosphorylated at Thr389 upon this interaction (see Fig. 2c, lane 2). The activation of p70S6K was not dependent on PI3K activity, however, as it was not suppressed by the PI3K inhibitors wortmannin (lane 3) or LY294002 (lane 4) but was inhibited by rapamycin (data not shown). After demonstrating that Tck could induce IL-10 production in M-CSF-primed monocytes, we investigated whether RA-Ts and without any further activation also could induce IL-10. Neither fixed RA-Ts nor freshly elutriated peripheral blood monocytes spontaneously produce IL-10 secreted into tissue culture supernatant. When these cell types were co-cultured together, however, monocyte IL-10 was produced (126 ± 35 pg/ml at a T:macrophage ratio of 5:1 [P = 0.0305] and 146 ± 26 pg/ml at a ratio of 7:1 [P = 0.0128]) (Fig. 3a). This IL-10 production is a consequence of physical interaction between these cells, as separation by a semipermeable membrane insert abrogated this production. The ability of monocytes to produce IL-10 was shown using lipopolysaccharide at 1 ng/ml as a positive control; IL-10 was routinely produced at levels greater than 200 pg/ml. In addition, RA-T cells also induced IL-10 production upon physical interaction with M-CSF-primed macrophages, which produced similar or slightly higher concentrations of IL-10 in co-culture (189 ± 23 pg/ml at a T:macrophage ratio of 3:1 [P = 0.0047] rising to 243 ± 28 pg/ml at a T:macrophage ratio of 7:1 [P = 0.009]) (Fig. 3b). RA-Ts also induced macrophage TNF-α production (81 ± 21 pg/ml at 3:1 [P = 0.0293], rising to 150 ± 26 pg/ml at 7:1 [P = 0.0047]) (Supplementary Fig. 2). These CD3+ RA-T cells were predominantly CD4+CD45RO+. In addition, the T-cell activation markers HLA-DR and CD69 were expressed, suggesting that RA-Ts were of an activated, memory phenotype closely resembling that of Tck . T cells from synovial membranes in rheumatoid arthritis (RA-Ts) induce macrophage TNF-α production. RA-Ts were co-cultured with M-CSF- primed macrophages and incubated for 24 hours at 37°C/5% CO2, after which supernatants were harvested and stored at -20°C until ELISA. Bars show mean TNF-α in triplicate culture supernatants ± SD, for a representative of N = 3 replicate experiments. Macros = macrophages; M-CSF = macrophage-colony-stimulating factor; T:M = ratio of RA-T to M-CSF-primed macrophages; TNF = tumour necrosis factor. *P < 0.05, **P < 0.01. We have shown previously that IL-10 is produced by both macrophages and T cells in RA synovial joint tissue, although the macrophages apear to be the predominant source of this cytokine . To explain the dynamics of cognate cell interactions in regulating IL-10 production in this tissue, we cultured the RA synovial cells either as a whole population or after T-cell-rich nonadherent cells were depleted from the adherent RA-SMCs. Depletion of nonadherent cells suppressed the spontaneous IL-10 produced in whole-population cultures of RA-SMCs. RA-SMCs spontaneously produce IL-10 and TNF-α over an incubation period of up to 4 days. The spontaneous production of TNF-α occurred in 6/8 tissue samples tested, with a range of 36 to 1047 pg/ml (mean production= 284 pg/ml). IL-10 was produced by 8/9 tissue samples, with a range of 38 to 1064 pg/ml (mean production= 420 pg/ml). Thus, in the representative experiment, the whole population of RA-SMCs produced 547 ± 16 pg/ml IL-10 upon in vitro culture (see Fig. 5). In comparison, adherent cells produced 82 ± 45 pg/ml (P = 0.0031) and nonadherent cells produced 16 ± 5 pg/ml (P = 0.0004), the lower limit of detection of the IL-10 ELISA being 13 pg/ml. Depletion of nonadherent (T-cell enriched) RA-SMCs suppressed the spontaneous production of TNF-α, while the whole population of RA-SMCs produced 441 ± 7 pg/ml, adherent cells produced 293 ± 30 pg/ml (P = 0.0173) and nonadherent cells produced 74 ± 11 pg/ml (P = 0.0006) (Supplementary Fig. 3a). In an attempt to compare Tck with RA-Ts (nonadherent SMCs), we added Tck back to RA-SMCs depleted of nonadherent cells (SMCs-T) (Supplementary Fig. 3b). Fixed Tck rescued both IL-10 and TNF-α production, while addition of Tck to SMCs-T increased IL-10 production from 36 ± 1 pg/ml to 474 ± 43 pg/ml and TNF-α from 13 ± 1 pg/ml to 804 ± 87 pg/ml. Spontaneous production of TNF-α by mononuclear cells from synovial membrane in rheumatoid arthritis (RA-SMCs) is dependent on interactions between adherent cells and nonadherent cells and reconstituted by addition of cytokine-stimulated T cells (Tck). RA-SMCs, SMC-adherent cells (depleted of nonadherent cells) and nonadherent cells (T-cell enriched) were cultured in 24-well plastic tissue culture plates at a density of 1 × 106 cells/ml per well for 24 hours at 37°C/5% CO2, after which supernatants were harvested and stored at –20°C until ELISA. Depletion of nonadherent cells suppressed cytokine production by the adherent population (SMC-T) (a). Bars show mean TNF-α in triplicate culture supernatants ± SD, for a representative of N = 2 replicate experiments. In addition, TNF-α production is reconstituted by Tck (b). Tck were added to nonadherent-cell-depleted SMCs (SMCs-T) at a Tck:SMC ratio of 5:1 and incubated for 24 hours at 37°C/5% CO2, after which supernatants were harvested and stored at –20°C until ELISA. Bars show mean TNF-α and IL-10 in triplicate culture supernatants ± SD, for a representative of N = 2 replicate experiments. TNF = tumour necrosis factor. *P < 0.05, ***P < 0.001. Having established that PI3K regulates macrophage IL-10 production upon interaction with fixed Tck, we needed to address the same question as regards the rheumatoid synovium. Therefore, the specific PI3K inhibitors LY294002 and wortmannin were used in the spontaneous production of IL-10 by RA-SMCs. LY294002 dose-dependently inhibited spontaneous IL-10 production, whereas wortmannin did not. LY294002 suppressed IL-10 production of control cells (208 ± 27 pg/ml) to 112 ± 17 pg/ml (P = 0.05) and 27 ± 2 pg/ml (P = 0.007) for 5 μM and 50 μM, respectively. Wortmannin had no significant effect on spontaneous IL-10 production, while control levels resulted in 208 ± 27 pg/ml compared with 191 ± 25 pg/ml in 500 nM wortmannin (P = 0.387, NS). 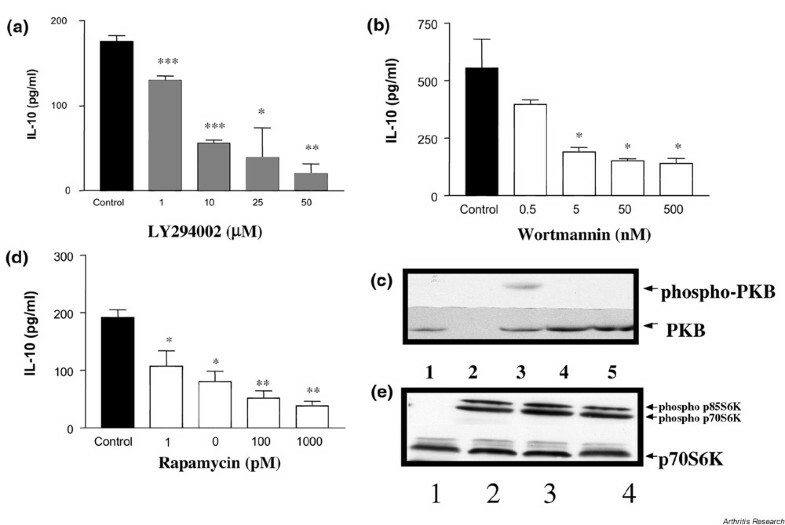 This lack of effect of wortmannin on IL-10 production was not a consequence of loss of activity, as the same wortmannin augmented TNF-α production by RA-SMCs in the same experiment (control levels of 74 ± 10 pg/ml were potentiated to 205 ± 27 pg/ml [P = 0.0062], 252 ± 14 pg/ml [P = 0.0004] and 425 ± 37 pg/ml [P = 0.002] by 50, 100 and 500 nM wortmannin respectively) (Supplementary Fig. 4b). 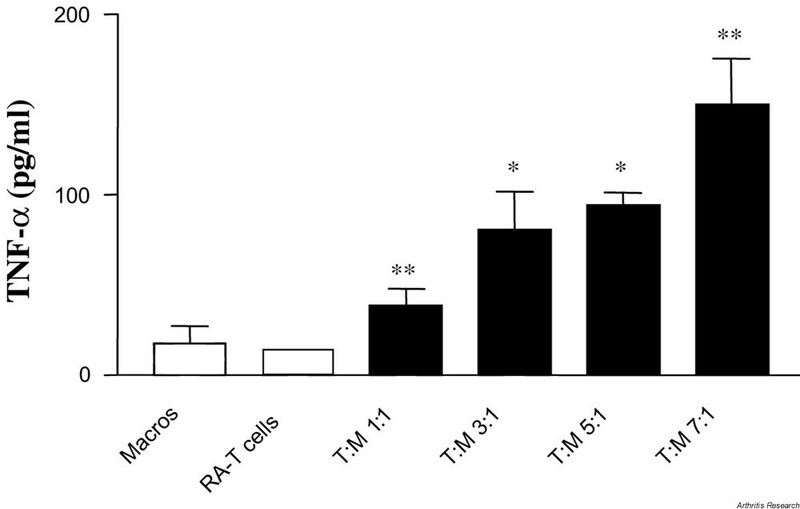 Again, this trend was repeated with LY294002, though it was not as pronounced as with the Tck/macrophage co-culture system, with the higher concentrations showing slight augmentation to spontaneous TNF-α production by RA-SMCs (Supplementary Fig. 4a). These data, again, demonstrate differential regulation by PI3K, as with the Tck/macrophage co-culture system. Inhibition of phosphatidylinositol 3-kinase (PI3K) augments TNF-α production by mononuclear cells from synovial membrane in rheumatoid arthritis (RA-SMCs). RA-SMCs were cultured in the absence (controls) or presence of the PI3K inhibitors LY294002 (a) and wortmannin (b) in 24-well plastic tissue-culture plates at 1 × 106cells/ml per well for 24 hours at 37°C/5% CO2, after which supernatants were harvested and stored at –20°C until ELISA. Bars show mean TNF-α in triplicate culture supernatants ± SD, for a representative of N = 4 replicate experiments. TNF = tumour necrosis factor. **P < 0.01, ***P < 0.001. This report establishes that RA-T cells isolated from RA-SMCs are capable of inducing IL-10 production by freshly elutriated monocytes and M-CSF-primed macrophages. In an attempt to compare the signalling events leading to macrophage IL-10 production between Tck and T cells derived from rheumatoid synovial biopsy tissue, PI3K and p70S6K involvement was determined by the use of wort-mannin and rapamycin. 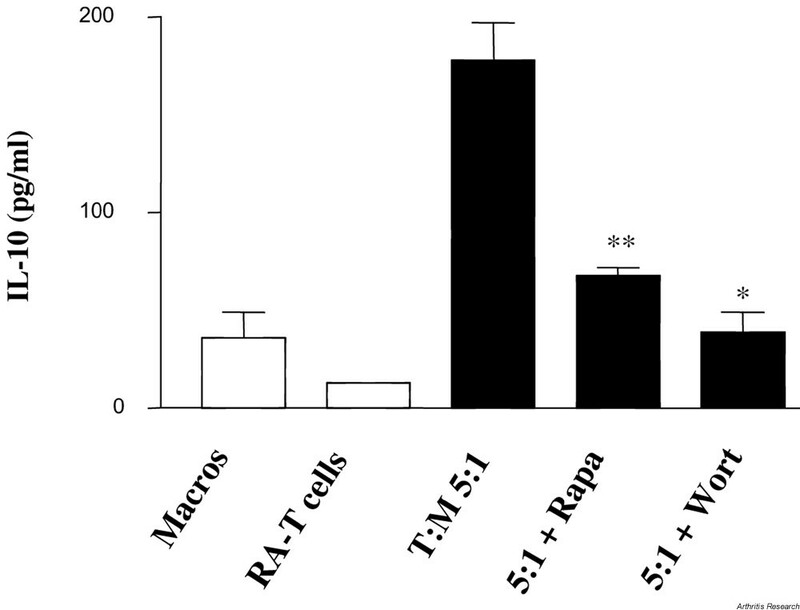 Co-culture of RA-T cells with M-CSF-primed macrophages at a T:macrophage ratio of 5:1 resulted in 178 ± 19 pg/ml IL-10, which was suppressed to 68 ± 4 pg/ml (P = 0.0097) and 39 ± 9 pg/ml (P = 0.0125) for rapamycin and wortmannin, respectively (Fig. 4). Rapamycin had little effect on RA-T induction of macrophage TNF-α production, while in controls (87 ± 32 pg/ml), it was elevated to 133 ± 16 pg/ml (P = 0.133, NS). Wortmannin inhibition of PI3K, however, augmented TNF-α production to 509 ± 65 pg/ml (P = 0.0033) (Supplementary Fig. 5). Induction of macrophage TNF-α production by T cells from synovial membranes in rheumatoid arthritis (RA-Ts) is dependent on phosphatidylinositol 3-kinase (PI3K). RA-Ts were added in co-culture with macrophages primed with macrophage-colony-stimulating factor at a RA-T:macrophage (T:M) ratio of 5:1 in the presence or absence of the PI3K inhibitor wortmannin (50 nM) or the p70S6K inhibitor rapamycin (1 nM) for 24 hours at 37°C/5% CO2, after which supernatants were harvested and stored at –20°C until ELISA. Bars represent mean TNF-α of triplicate culture supernatants ± SD, for a representative of N = 2 replicate experiments. Macros = macrophages; Rapa. = rapamycin; T:M = ratio of RA-Ts to M-CSF-primed macrophages; TNF = tumour necrosis factor; Wort. = wortmannin. **P < 0.01. PI3K appears to play a role in Tck and RA-T induction of macrophage cytokine production, but caution is needed when interpreting data using specific inhibitors. It is well established that LY294002 and wortmannin are PI3K inhibitors, with LY294002 being the more specific. However, at high concentrations, wortmannin can inhibit several other enzymes, including phospholipase A2, phosphatidylinositol 4-kinase, phospholipase D and myosin light-chain kinase. To ascribe PI3K specificity to the observations being described, these inhibitors were routinely tested for the ability to inhibit PI3K by abrogation of PKB phosphorylation. 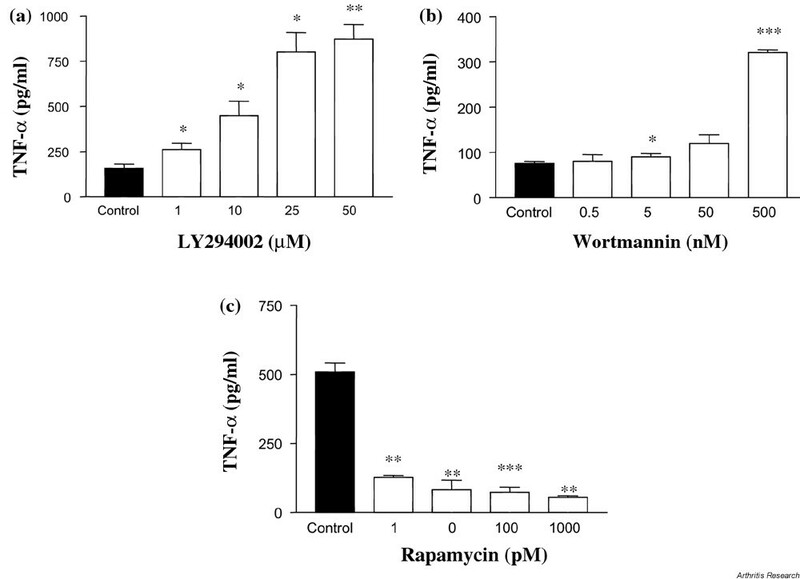 In addition, the specificity of PI3K was validated by the TNF-α augmentation (see Supplementary Figure 1) where both wortmannin and LY294002 resulted in similar responses. Because wortmannin irreversibly inhibits PI3K, its lack of effect on RA-SMC IL-10 production over 24 hours may reflect the turnover rate for PI3K in these cells, which probably differs from that observed with M-CSF-primed macrophages. The supplementary data presented here suggest that the signalling pathways involved in Tck-induced macrophage IL-10 and TNF-α share a common component, p70S6K. PI3K however, differentially regulates IL-10 and TNF-α production – IL-10 positively, and TNF-α negatively. 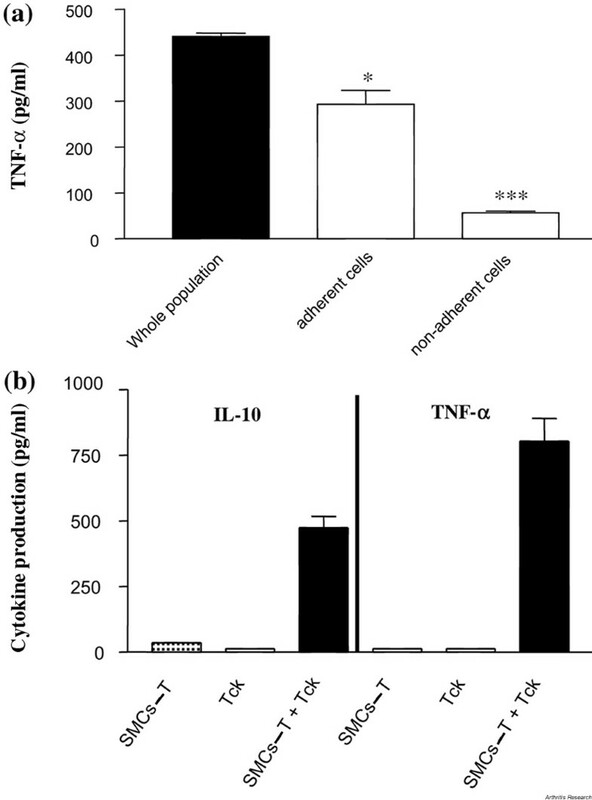 Negative regulation of TNF-α would appear to be independent of IL-10, as neutralisation of endogenous IL-10 does not affect wortmannin's augmentation of macrophage TNF-α upon interaction with Tck (data not shown). These observations of PI3K involvement appear to be reproducible by RA-SMCs and RA-T/macrophage co-culture, potentially validating the Tck/macrophage model for the study of cytokine production with respect to cellular interactions in the rheumatoid joint. These data suggest that the PI3K pathway is a potential therapeutic target, activation of which may induce IL-10 while concomitantly suppressing TNF-α production, redressing the balance between pro-inflammatory and anti-inflammatory cytokines produced in the rheumatoid joint. We thank Dr Ferdinand Lali for help in setting up phospho-western blots and Dr Abhilash Jain, Mr Gurdeep Kahlon and Mrs Sarah Field for obtaining and preparing RA-SMCs. This work was funded by a Wellcome Trust project grant.